I was a long-time Washington Husky fan, and I harbored dreams of playing for my favorite team, but they did not recruit me, even as walk-on, which is an opportunity I would not have passed up. You see, as a senior at Roosevelt High School in Seattle, I was selected All-City as a running back, setting a record for yards-per-carry (8.5) and kicking a field goal, which at that time in high school, was an unusual occurrence. This turned out to be a recruiting opportunity missed that would bring misery to Washington’s head football coach, Jim Owens. Instead, I researched Oregon’s decorated school of journalism and the smaller running backs that had toted the pigskin for the Ducks. I also liked the uniforms and having been recruited as a walk-on by assistant coach Bruce Snyder, (future HC at Cal and ASU) I got on a train and headed for Eugene. In those days, the freshman team was separate and played only four games: two against the Beavers and one each against Washington and Washington State. 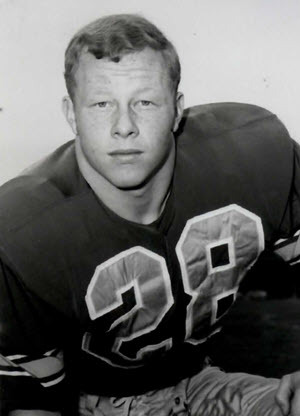 I had a very successful season (1967), especially against the Husky Pups, blocking a punt, kicking a field goal and three extra points in a 30-7 romp in Husky Stadium. It was a great homecoming and my first victory in a quest for respect. I also kicked a decisive field goal to help win the second game with Oregon State. I did not get much sleep the week before the Husky game, as I tossed and turned in an angry buildup for the revenge I was focused on for the Huskies’ arrogance of not recruiting me. The freshman win set the stage for more installments of Woody’s Revenge. 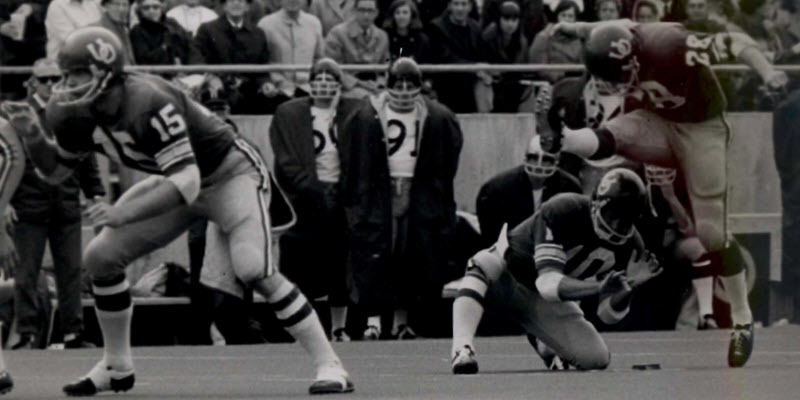 In 1968, before a rain-soaked crowd of 58,000 in my hometown, the Ducks and Huskies fumbled and bumbled for 56 minutes and Oregon had moved the ball deep into Washington territory. I was called on to kick a field goal, which was wide to the left. Unfortunately for the Dawgs, the referee was looking as one of their defenders rushing the kick gave me an elbow to the helmet as he ran by me. After the penalty and several unsuccessful offensive plays, Coach Jerry Frei called my number again and this time I did not miss—final score 3-0 after the defense held the Huskies four plays inside the Ducks’ ten-yard line. It was Jerry’s first conference win. My legacy grew exponentially. I was carried off the field by my teammates who had pounded me all week on the scout team—such was the plight of a kicker who also played defensive back. The buildup to that game was the same as the year before: not much sleep, tossing and turning and thinking about how much I hated the Huskies; every night! When game time came, I was out of control—my hardest hits came in pre-game tackling before Washington games. I would let out a primal scream each time; hoping Husky coach Jim Owens could hear every one. I worked as a substitute sports writer for the Seattle Post-Intelligencer during the summer and after the game, one of the PI’s reporters, much to my glee, asked Owens if he ever thought he’d get beaten by a sportswriter? But my revenge, to that point sweet, had not been fully realized; after all, I still had two more games left against the Huskies before I graduated. What can I say? I was pretty happy to beat the Huskies. 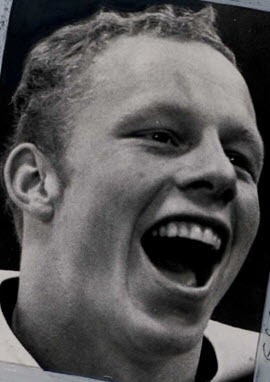 In 1969, the week after a 60-13 thrashing at the hands of Air Force, Frei told the Duck Club that no one would have to ask him to quit if he wasn’t satisfied with how his team responded in the upcoming Husky game. In the locker room, on Monday, Duck players were in tears as they heard his promise; Washington had no chance. On Saturday, in Autzen Stadium, I kicked three field goals that put Oregon ahead 9-7 and after the last one, turned and shouted to Owens, “you should have recruited me!” The final was 22-7 and the week leading up to the game was like all the other Husky games—no sleep, excessive adrenaline and an intensity I had never experienced before. I was constantly visualizing dominating the Huskies, this time as a wide receiver, a position I switched to that fall. In 1970, Oregon had one of its better teams in several years, with the likes of Dan Fouts, Bobby Moore, Tom Graham, Leland Glass and Tom Blanchard being the matinee stars, along with me, who seemed to have one good game a year—against the hated Washington Huskies. The game was in Seattle and it was a thrill to be picked a captain and go out for the coin toss and shaking the hand of the Huskies’ Bo Cornell who had played on the same little league team with me when I lived in Seattle. The stage was set for the “hat trick”: three wins over my rivals. The Ducks had back-to-back wins over UCLA and USC and had stuck their nose into the race for the roses coming into Husky Stadium. I kicked a school-record field goal that game, had another one blocked and hit the upright on an extra point try, lost points that would end up decisive in a 25-23 loss. The Huskies had the last laugh and I was crushed after visualizing every day of the year about beating Washington again. I was in shock and it hurt, forever. 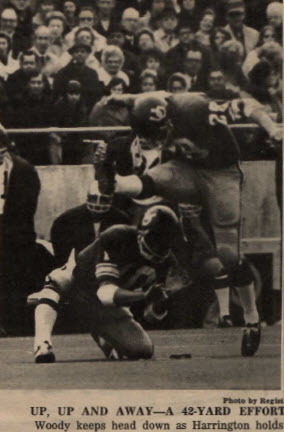 One of the winning field goals against Washington with John Harrington, (Joey’s father) holding. Further irony came after I graduated and coached Jerry Frei’s last season in Eugene. He went on to the Denver Broncos and I ended up coaching for Owen’s last three years at Washington. I was shocked to learn that Husky players were just like Ducks, and that they had immense respect for Oregon. My time in Seattle was cathartic, balancing out my hatred with respect and admiration for Owens, who I would classify as a great, dignified football coach. The intensity of the rivalry and my own personal feelings made the annual game with Washington a huge part of my development as a college coach and later, as a sportsman who could shake off the hatred and realize the Huskies and Ducks were built of the same cloth. We played three times and the Dawgs won twice, a close one in 1972 and a romp in 1974. In between, in Eugene, Oregon won 56-0 and although on the losing end, I could appreciate how delicious the victory was for the Ducks. I went on to television with FOX as a commentator for Oregon and worked with Sonny Sixkiller, an Oregonian quarterback who led the Huskies to many wins over his career. He was a good man, who was very respectful and appreciative of the Ducks’ football program and in his own right, furious the Ducks overlooked him in recruiting. I felt I was lucky to have worked both sides of the rivalry and once my playing days were over, decompressed and gave the Huskies their due. Think of this when you root for whomever you’re going to, lose yourself in the intensity of the greatest rivalry Oregon gets to play. When the game’s over know there are great young men on both sides, despite how they acted during the game. I love to hate the Huskies, and also got to do that as an assistant at Washington State towards the end of my coaching career. But when the games are over, I’m glad they are the Ducks’ rival. It wouldn’t be as much fun without them.